*Sadie Hawkins Day is officially celebrated on the first Saturday in November, but Sadie Hawkins dances may be held whenever an organization decides. 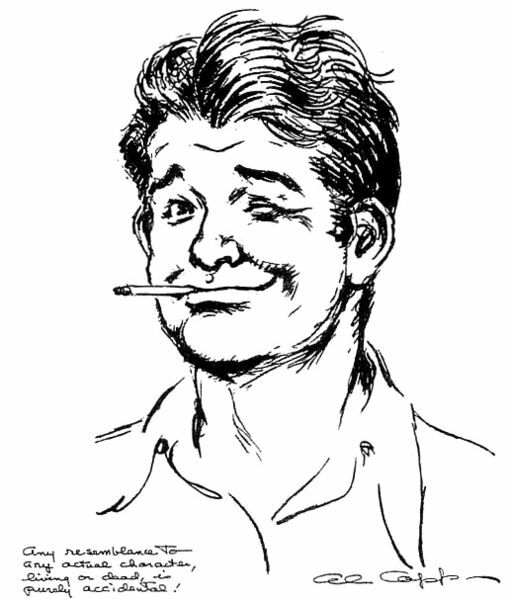 From 1934-1977, Al Capp produced the Li’l Abner comic strip about the hillbillies of the fictional town Dogpatch, Arkansas. And, in November of 1937, Capp first produced one of his most memorable legacies – Sadie Hawkins Day. When Sadie Hawkins, the “homeliest gal in all them hills” reached 35 with nary a beau in sight, she, and her father, had had enough. Hekzebiah Hawkins declared a new event – Sadie Hawkins Day. On Sadie Hawkins Day, every eligible bachelor got a bit of a head start before Sadie took off after them. If Sadie caught one and dragged him across the finish line by sundown, he had to marry her. The event was so popular with people in the real world and the old maids of Dogpatch, that they decided to make it an annual event. 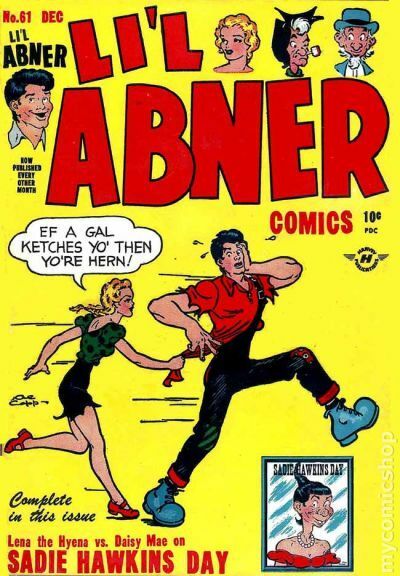 For the next 40 years, the November comics for Li’l Abner always included a Sadie Hawkins race. Within just a few years, people around the U.S. began celebrating Sadie Hawkins Day, either on the first Saturday in November, the Saturday after November 9, or whatever November date best fit their schedule. However, instead of matrimony, Sadie Hawkins Day usually resulted in women asking men to a dance instead. “When Boaz had finished eating and drinking and was in good spirits, he went over to lie down at the far end of the grain pile. Ruth approached quietly, uncovered his feet and lay down. In the middle of the night something startled the man; he turned—and there was a woman lying at his feet! P.S. Book Lovers’ Day is also held on the first Saturday in November (and on August 9). P.P.S. November 2 is also Look for Circles Day. Yes, you read that right. Look for Circles Day. If you know why, you are way ahead of me. This entry was posted in Uncategorized and tagged November 2013, sadie hawkins. Bookmark the permalink.